How do you organize content on social media sites for showcasing? 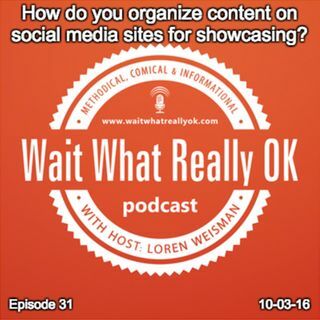 Wait What Really OK Podcast Episode 31 hosted by Brand Precision Marketing Strategist and Counselor, Loren Weisman, discusses the idea of using different social media sites as file cabinets of sorts for your content. Sites like Pinterest can serve as a file cabinet of organization to be able to high light , spotlight and put the focus on specific materials. Asking some one to scroll through a sea of content to find ... Más informaciones what you want them to see or sending them a dozen links is a pain. By organizing in folders and on social media sites that people know, you are showcasing a professional, organized and attention to detail message that can easily lead people right to what they want to see and hear. Do you really want to exploit a tragedy or death for your marketing? Ep31 of the Wait What Really OK Podcast is available on iHeartRadio or on Spreaker. Podcast Blog Supplement for Episode 31 of the Wait What Really OK Podcast with Loren Weisman. Podcast Link Supplement for Episode 31 of the Wait What Really OK Podcast with Loren Weisman. Does one size fit all with branding and marketing? Podcast Video Supplement for Episode 31 of the Wait What Really OK Podcast with Loren Weisman. Podcast Photo Supplement for Episode 31 of the Wait What Really OK Podcast with Loren Weisman.